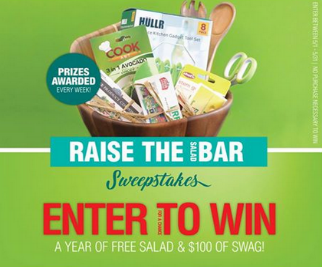 Litehouse Foods “Raise the Bar” Sweepstakes – Win a year’s worth of salad & a salad tool kit! Win a year’s worth of salad & a salad tool kit (15 winners)! ENTRY LIMIT – Entrants are eligible for one (1) entry during the duration of the promotion. ELIGIBILITY – The Promotion is open only to legal residents of the United States, (excluding Puerto Rico and any other U.S. territories) who are 18 years of age or older and have reached the age of majority in their state as of May 1st, 2018. SWEEPSTAKES ENTRY PERIOD – The Promotion begins at 12:00:01 Pacific Time (“PT”) on May 1, 2018 and ends at 23:59:59 PT on May 31, 2018. PRIZES – 15 (15) prizes available: A year’s worth of salad in the form of twenty-four (52) free Litehouse product coupons (valued at $6 each), twenty-four (52) free NatureSweet product coupons (valued at $5 each), and twenty-four (52) free Fresh Express product coupons (valued at $5 each) plus a salad kit consisting of: Bamboo cutting bard ($16 value), Wooden Salad Bowl ($22 value), Herb Scissors ($11 value), Wooden Salad Servers ($10 value), Strawberry Huller ($8 value), Kitchen Gadgets Tool Set ($10 value), and an Avocado Slicer ($8.50 value). Prize awarded by mail, to one individual Entrants, and shall require signature upon delivery. Winners will be announced via social media channels and the Sponsor’s website no later than June 30, 2018.